New - this page will now be home to my book reviews. They are also available on my book review blog Writing 'Bout Reading. My musings about life and libraries continue at booksnquilts. Wow! 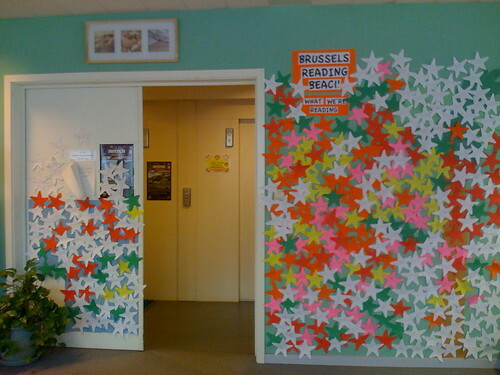 Look how many books Brussels kids have read!!!! Behemoth by Scott Westerfeld. Simon Pulse, 2010. In Behemoth, Westerfeld returns to the alternate history he began in Leviathan, continuing the story of Deryn Sharp, a girl posing as a boy in the British Air Service, and Alek, the exiled and hunted heir to an empire. This alternate world is home to Darwinist countries, including Britain, who are at war with the Clanker countries, led by Germany. Darwinists have mastered genetic engineering, breeding “beasties” that are adapted to perform as living machines, while Clankers call such creatures abominations and base their technology on steam-driven machines. Though Behemoth is the second book in a trilogy, it has its own vital storyline and does not fall into the middle book trap of serving only as a bridge between the first and last volumes. Deryn’s and Alek’s adventures in Istanbul radically impact the Ottoman Empire’s government and the balance of power in the war. Deryn’s ongoing masquerade as Dylan becomes ever harder to sustain. And Alek’s escape from Leviathan leads him to a partnership with a local revolutionary group. Deryn’s growing attraction for Alek also entangles her in the rebel conspiracy leading to an explosive climax. Westerfeld’s characterizations are vivid, with even minor characters fully developed and engaging. Readers will be hard pressed to forget the shrewd Nene in her clockwork bed. The setting comes to life with dynamic descriptions of Istanbul and the various beasties and machines Alek and Deryn encounter. One minor criticism is that the portrayal of Deryn’s double identity occasionally feels strained. Overall, however, Westerfeld has again produced an exiting, well-written adventure that will leave fans eager for the next installment. The Red Queen by Philippa Gregory. Simon and Schuster, 2010. Margaret Beaufort, the Red Queen of the title, was a driven and ambitious woman. From a young age she chafed at the restrictions her time placed on women, convinced that she was chosen by God to be the English equivalent of Joan of Arc. Her dream is to see her son, Henry, restored as the rightful King of England and eventually having everyone recognize that she is as great as she believes herself to be. Sadly, the portrayal of this Red Queen is one-dimensional and Margaret comes across as almost a caricature, rather than a real person. Margaret was not a sympathetic person to start with, but Gregory reduces her to a woman completely blinded by her ambition. The few moments of humanity are so brief as to only emphasize the image of a cold-hearted monster. I am a fan of historical fiction and had high hopes for this book when I saw the care Gregory took to be historically accurate. But in the end, I couldn't bring myself to care at all about Margaret or any of the other characters. I almost quit reading two-thirds of the way through because I knew what would happen and really wasn't interested in what else Margaret went through to achieve her ends. For die hard fans of all things Tudor, this book is a must read. But those seeking a more subtle approach with well-rounded characterizations will likely be disappointed. Lowry, Lois. Bless This Mouse. Illustrated by Eric Rohmann. Houghton, Mifflin, Harcourt, 2011. 160 pages. $15.99. Bless This Mouse by Lois Lowry is the heartwarming chronicle of the mice of St. Bartholomew’s church. This community of church mice, led by Mouse Mistress Hildegarde, tries to live quietly, avoiding the notice of the Father Murphy, the Altar Guild and other people of the parish. But as they consider preparations for the annual Blessing of the Animals on the Feast of St. Francis, which means cats in the church, they face an even bigger danger. They’ve been spotted. That means, the Great X, something they fear even more than cats. Hildegarde shepherds her charges on an adventure into the outdoors with the help of her friend and supporter Roderick and a former college library mouse named Ignatius. The characters are lively and well-developed from the ditzy mouse mother having her litters in the most inappropriate places to jealous Lucretia who envies HIldegarde her position as Mouse Mistress. Rohmann’s charming and whimsical illustrations bring the characters to life. 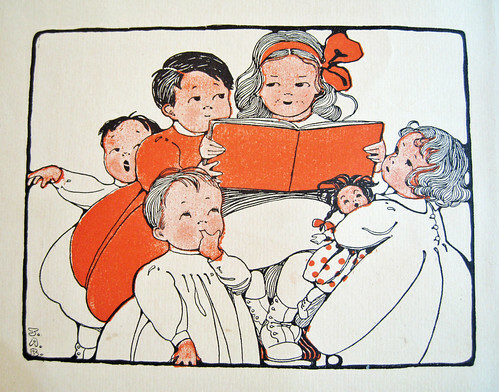 Image from the Mary Frances Cookbook by Jane Eayre Fryer, copyright 1912, with wonderful illustrations by Margaret G. Hays and Jane Allen Boyer. This one is Mary Frances reading to other small children. With thanks to Catnip Studio!